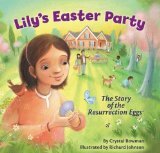 Lily’s parents are planning to hide eggs for Lily and her brother to find. Lily can hardly wait, so she invites her friends to join them. But when the day arrives, they find a big surprise. These aren’t ordinary eggs – they’re Resurrection eggs. No toys are placed inside these eggs – instead they find symbols of the Easter story. A guide for what each symbol represents, plus the appropriate Bible verses, is provided. As each egg is opened, Lily’s parents explain the item’s significance. For me, personally, this was a nice story until the egg with the chalice was opened. At this point, Lily’s mom tells her that it represents the Last Supper. But her mother uses the word “like” in this explanation, which is not in the Bible: “…the wine was like his blood” and “… the bread was like his body.” This wording is not biblically accurate. For those who don’t take these words of Jesus literally and don’t mind an interpretation, this is a cute Easter book. But for those who expect the literal words and not a paraphrase of what Jesus said, this book is not a good choice.